You have to forgive us but our views about Dalmatians are slightly biased. Maybe I can try and say a few words without going overboard by telling you the story on what made us decide on a Dalmatian? We wanted a medium sized, short coated, colorful and active dog that was as healthy as any mammal can be and full of personality. Our dog had to be friendly since we had small children at the time and I also taught horse riding lessons at different facilities where the dogs could come along to join me. At the time we led a very active outdoor lifestyle, either at our own Horse Yard or somebody else’s. When this lifestyle changed due to Paul’s profession and our move to another country, we were a little concerned on how the Dalmatians would cope. As you can see, the Dalmatians were here to stay as the change of circumstances did not matter; it mattered that they were still part of our family and treated like any active dog should be of their size. So if you are a “Dog Person” and can cope with constantly wagging tails, dogs that can always smile and may just out smarten you occasionally, you are welcome to pay us a visit. Before you set out to view your possible future puppy, you should make sure that you like the adult dog. It is not a bad idea to go and visit a few dog shows. This will give you a good preview about the actual size and temperament of your chosen breed. There will be plenty of breed enthusiasts who will be more than happy to share their information with you. Information about locations and dates for shows are readily available on the web and can be found on most breed clubs or Kennel Clubs web pages. Each one of the over 400 registered breeds worldwide has got its own breed specific problems. Some more, some less. The main issues with Dalmatians are the possibility of unilateral or bilateral deafness, which they share with over 60 other breeds, and the unique possibility of forming the same urate stones as human beings. A reputable breeder will BAER (hearing) test all his breeding stock and would not breed from unilateral or bilateral deaf parents. He will also have all his puppies tested by a fully qualified veterinarian before they leave his kennels. Don't just take a breeders word for it though, ask for the documents to prove this or check the OFA Database. 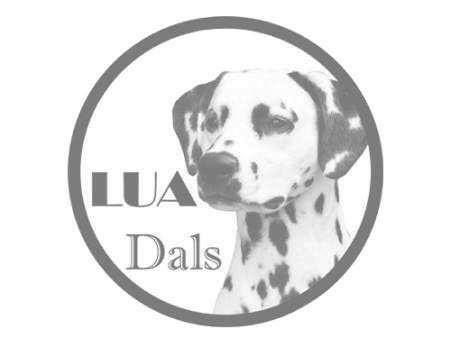 Regarding the different metabolism of a Dalmatian (causing high uric acid levels), and the possibility of urate stones, a reputable breeder will always advise you on how to feed and manage a Dalmatian and how to reduce the risk that their puppies will eventually form stones. It certainly does not happen to all Dalmatians. Not even a very large amount of dogs will ever form stones, if you know how to manage your Dalmatian correctly. In the 1970's, Dr. Schaible from the US started a breeding program to eliminate high uric acid from the Dalmatian breed by crossing in one Pointer. The so called LUA or backcross project has since been continued. To read more about the project and why it will take a long time to introduce the Gene to all Dalmatians bred, follow the link below. 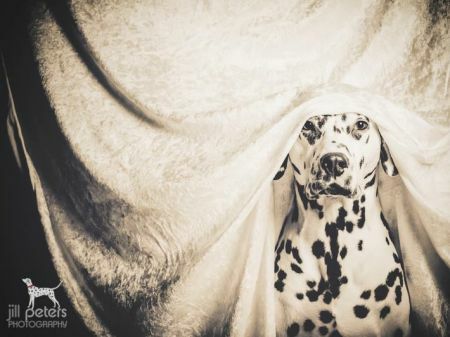 Of course Dalmatians can suffer from general canine diseases (they are mammals and even humans carry up to 70 recessive traits, which can lead to diseases), which is why a reputable breeder of Dalmatians will perform further health checks. In the USA all official health test results are listed on the database of the Orthopedic Foundation for Animals. Breeders of Dalmatians, who do not list their Puppies bred, on the OFA database cannot be considered responsible Breeders. As with every breed, Dalmatian temperament, health and training starts far before you, the buyer, has an influence on it. It starts at the Dalmatian breeders’ kennel. Between the age of 4 and 8 weeks the Dalmatian puppy goes through a very important stage in life - let's call it the formative period. During the first two weeks of this period, mom and the litter mates of your Dalmatian puppy will be the tutors. While they are playing together, important dog rules are established. It is therefore very important that the mom of the litter is a well socialized one. Other pack members are also introduced to our Dalmatian puppies, just like within a wolf pack where aunties and uncles will help mom to educate the little one. From week 6 to 8 it is the Dalmatian breeder's job to introduce the Dalmatian puppies to everyday life situations such as household noise, indoors, outdoors, children, car journeys and many more. If this period in the Dalmatian puppies’ life goes wrong, it will not be possible to grow to its full potential – ever! Being handled from day one, growing up in a working canine and human family, getting accustomed to noises, different floor types, everyday occurrences and being fed a species apropiate diet, can make all the difference in the world. This is why YOU need to choose a breeder of Dalmatians, who feels passionate about what they are doing, because if they do not put the effort in, then the Dalmatian puppy and you will lose out. We use a variety of purpose built toys, such as swings, bridges and other noise creating devices to accustom our Dalmatian puppies to a variety of everyday life situations and to prepare them for the outside world whilst they are still in their trusted environment. We assure you, that we do everything possible to choose parents of sound construction, mind and health plus our efforts mentioned above. As from eight weeks of age, it is then over to you to utilize these advantages. If you have not been able to find your Dalmatian Puppy in our Dalmatian Puppies section, you may find our Dalmatian Puppy Resource page helpful. The Dalmatian Puppy Resource page will provide you with further information and many links on how to find your Dalmatian puppy or a Dalmatian Rescue Organisation. It is over to you. 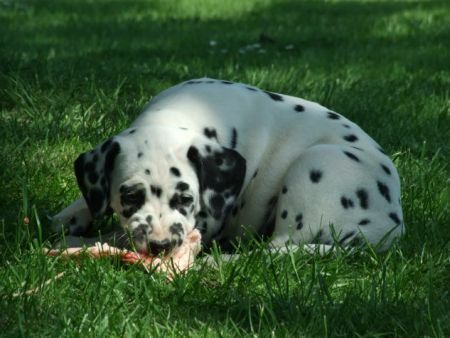 The breeder of your Dalmatian puppy has ideally provided everything possible your puppy needed up until eight weeks of age, but it is vital that you continue the good work. Since you are adopting an unspoiled baby that is new to you and your environment, you must first establish trust. Your Dalmatian puppy needs to learn that he or she can depend on you to make important decisions and that you will support it. Once trust is established, you need to be aware that you only have a relatively small time window to introduce your Dalmatian puppy to everyday life situations. By the time a Dalmatian puppy is four months old, it must have been introduced to as many different noises and circumstances as possible. Whilst these are the most important subjects for you to study, we felt that there was not enough space in a single tab, to provide you with all the knowledge needed. Modern science moves incredibly fast. More and more studies are performed on canine feeding, vaccination schedules and spaying or neutering as well as training your dog to become a good citizen. All of these are important factors that will keep your Dalmatian healthy and happy. Here at Caprilli, we constantly attend seminars and are surrounded by experienced breeders, trainers, behaviourist, judges, veterinarians and geneticists. This provides us with a great amount of knowledge, to be shared with you. 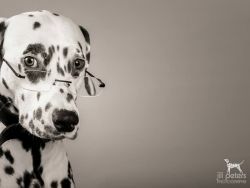 We understand that an everyday busy lifestyle can make it difficult to obtain the same amount of expertise in every subject for each owner of pet Dalmatians. 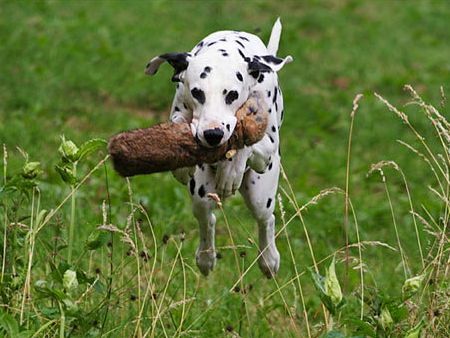 This is why we have created our Dalmatian 101 for you, to provide you with the latest findings. You will find Video tutorials as well as many useful hints and tips on how to manage your Dalmatian puppy. Please follow the links below for detailed information.